Nowhere on Earth is the impact of climate change being felt more acutely than in the Arctic, where dramatic increases in air and ocean temperature, loss of sea ice and disruption of weather patterns are catapulting this frozen region into an unknown future. 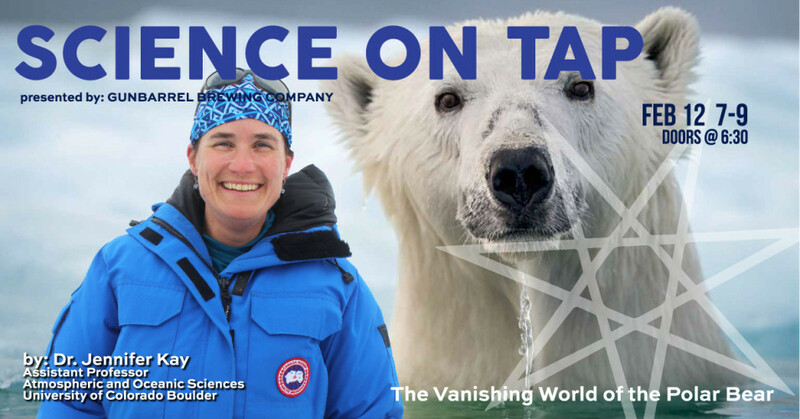 Come and learn about this vanishing world through the eyes of a scientist and field researcher who has worked with polar bears, polar bear biologists, and confronted the fateful meaning of warming in a land of ice. University of Colorado scientist Jennifer Kay studies these changes first-hand. An Assistant Professor of Atmospheric and Oceanic Sciences, Kay analyzes satellite and ground-based observations and runs climate models to help scientists better understand how changes in clouds and ice will change the Arctic’s future - and ours. In addition to atmospheric research, Dr. Kay works with Polar Bears International - the world's leading polar bear research and conservation organization (http://www.polarbearsinternational.org). This work has brought her to Churchill, Manitoba, known as the polar bear capital of the world. There each fall, hungry polar bears outnumber people as they gather along the shores of Hudson Bay to wait for sea ice to form. And as the Arctic warms, the hunting grounds for these specialized predators are vanishing. Over her career, the transformation has been mind-boggling. Arctic air temperatures for the past five years have exceeded all previous records since 1900. The 10 lowest summer sea ice extents have all occurred in the last 11 years. In the past 33 years, the old, multi-year sea ice that helps keep the Arctic frozen in summer has declined by 95%, with profound consequences for ice-adapted wildlife like polar bears.